A Ferrari California T introduced as “The McQueen” at the Paris Motor Show in 2016. Ferrari came to the 2016 Paris Motor Show with four special cars, each styled in a way reminiscent of famous drivers of its cars. There was the Stirling Moss F12 Berlinetta, the Michael Schumacher 488 GTB, the David Piper 488 Spider and the Steve McQueen California T. But according to a recent lawsuit by McQueen’s son, Ferrari used the late actor’s name to advertise and sell the car without the family’s knowledge or consent. The cars marked Ferrari’s 70th anniversary, which the company celebrated by making 350 special-edition vehicles to sell. Ferrari offered 70 different liveries across five cars honoring famous people who drove its cars, with one of those being McQueen. McQueen, who starred in the 1968 movie Bullitt, had a brown 1963 Ferrari 250 GT Berlinetta Lusso given to him by his wife. 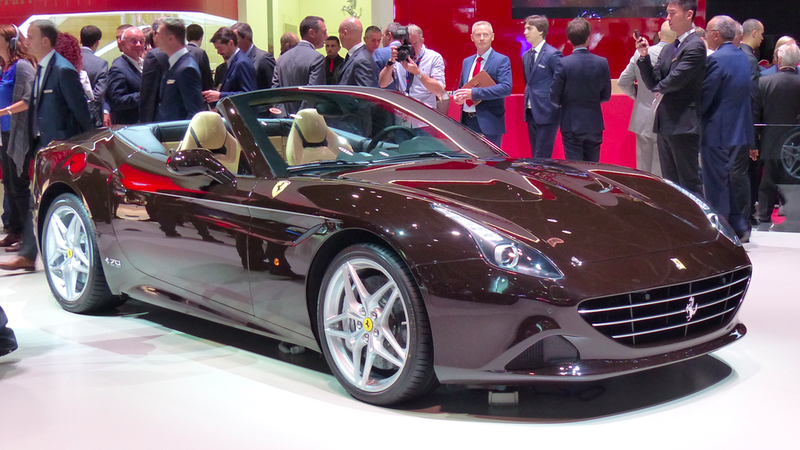 Ferrari brought the California T to Paris in that same brown. Less than two years later, Steve McQueen’s son, Chadwick McQueen, filed a lawsuit in the Superior Court of California in Los Angeles over the car. Court documents show that Chadwick McQueen and the bank acting as a trustee for Steve McQueen’s testamentary trust filed on July 30 of this year, and The Hollywood Reporter published the news and the full complaint soon after. Chadwick McQueen, who the lawsuit said is the co-owner of Steve McQueen’s trademark rights, alleges that Ferrari used his father’s name on the car and in advertising it without telling or getting consent from the family. Online records show that there is no counter from Ferrari yet, in which the company would accept or deny the claims against it. Since there is no counter, Jalopnik has asked Ferrari for comment on the lawsuit and will update this story if we hear back. The lawsuit has images of ads and Facebook posts from Ferrari that directly mention Steve McQueen, and said Ferrari changed the name of the car to “The Actor” after representatives for the plaintiffs contacted Ferrari about it. But, the lawsuit alleges and has a screenshot of, Ferrari continued to reference Steve McQueen on its webpage for the car. In the lawsuit, Chadwick McQueen and the bank acting as a trustee asked the judge to stop Ferrari from using Steve McQueen’s name and likeness in regards to the car, for the “destruction” of all prior marketing on the car relating to Steve McQueen, for all of the profits earned by Ferrari in relation to the Steve McQueen-themed California T, and for damages relating to the alleged trademark violation. The Hollywood Reporter has the full complaint here.